The rapper is set to executive produce and appear in a show about her early years in Queens. Nicki Minaj has spent the better part of the last 24 hours telling her fans on Twitter that she has a big surprise for them. It seems that the reveal is today's announcement that Minaj is reportedly set to produce and appear in a half-hour comedy based on her life for ABC Family. 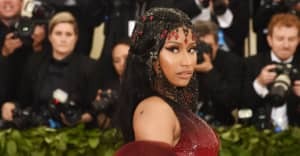 According to Deadline Hollywood, ABC Family has already committed to the show, which will shoot its pilot this winter and will be based on Minaj's childhood "in the 1990s with her vibrant immigrant family and the personal and musical evolution that lead to her eventual rise to stardom." In her FADER cover story back in 2014, shortly after making her big screen debut in The Other Woman, Nicki spoke on her ambitions outside of music. “I’ve done things where people are like, ‘Uhhhh,’” she said. “But every time I do a business venture or something that isn’t the norm for a female rapper, I pat myself on the back. It’s important that corporate America can see a young black woman being able to sell things outside of music." And on Instagram, she added that she's "launching a nation wide search" to find an actress to play that young version of herself.